Lupe Rankin was 17 years old when she was placed into foster care. In her first week of care, Rankin moved foster homes eight times. “I wasn’t in a home long enough to unpack my stuff,” she said. Rankin was in an unstable place in her life and she knew the homes she was placed in wouldn’t help—people with kids of their own and other, younger foster kids didn’t have time to give her the care she needed. Her condition spiraled. She threatened to kill herself. “It was really hard for me to grasp the concept that my mother was unwilling and unable to have custody of me anymore,” she said. Then, she was moved to a residential mental health care center, where she received treatment and learned healthier ways to cope with her feelings and circumstances. After two months in treatment, Rankin’s caseworker, working with Catholic Community Services, found a therapeutic foster home with the Rankins. The Rankins only accepted older girls in foster care, because they knew that demographic is hard to place. They were able to give Lupe the time and care she needed to heal and reach her full potential. “Living with them was amazing, I could be a normal teenager,” Lupe said. After living with the Rankins for two years, Lupe moved out and began living on her own, with the support of the Rankins. Now, at age 20, she works as an in-home caregiver for senior citizens and is saving money to move and intern in the residential facility she was placed in after entering the system. That’s a highly abbreviated version of the story of just one of the hundreds of children who come through Marion County’s foster care system every year. Lupe says her story isn’t the most extreme case in the system. “At that treatment center, I realized my issues were very small compared to those who have been in foster care since they were babies,” she said. While there’s no typical experience of a child in foster care, there is data on what the experience can look like for young people who find themselves swept up by this system. 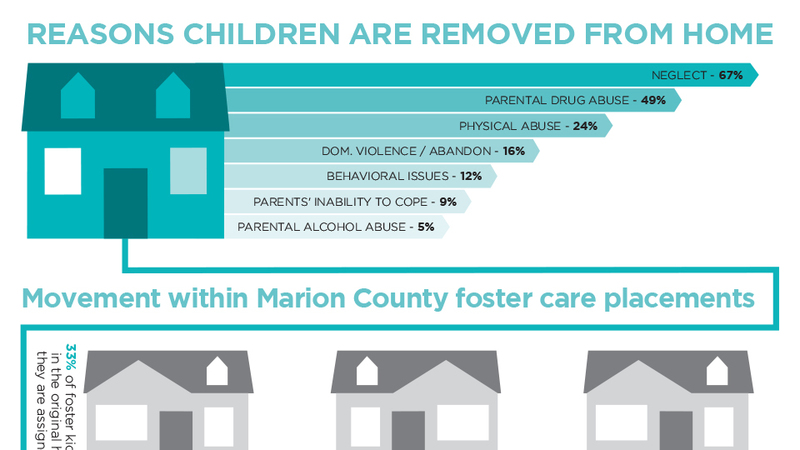 According to Marion County foster care data aggregated by the University of Kansas, 39 percent of kids in the system are in nonrelative homes, like Lupe. In the first quarter of 2018, 32 percent were in relative foster homes, and the remainder were in other types of care, including group homes and independent living programs. Due to a shortage of homes, kids in care often move placements. When children need one-on-one attention or have special needs of some kind, they’re often placed multiple times before they find a foster home that’s suitable or are transferred to a different level of care (residential treatment, for example). About a third of children in the system are only placed once before exiting care and a quarter are placed twice. At the other end of the spectrum, 16 percent of foster kids are placed six or more times, as was true in Lupe’s case. The knowledge that other kids are in much worse scenarios motivates former foster kids like Rankin to get involved with changing the system. To this end, Rankin began working with Oregon Foster Youth Connection (OFYC), an advocacy organization that mobilizes current and former foster youth to engage in changing the system for the better. Before pulling away from the organization to focus on work more recently, Rankin served as the Marion-Polk County Chapter lead for OFYC and was named an Outstanding Young Leader by the advocacy organization FosterClub in 2017. A big part of OFYC’s work is connecting foster youth not just with advocacy campaigns but also with each other. For Royce Markley, a recent graduate of the University of Oregon and a former foster youth, getting engaged in the advocacy world began with the realization that he shared a meaningful connection with those who had been through the system. “We had these experiences in common that we couldn’t relate to other people,” Markley said. Markley’s journey through the system was not a linear one. Due to neglect, abuse and a mother who struggled with drug addiction, Markley was placed in care for a period when he was a baby. After a stint in care, he was returned to his biological family, only to enter into care again at the age of 14. Markley lived in eight different homes during his time in care and attended three different high schools. And while he never faced abuse in his placements, if the system were more fully staffed and supported at all levels, the experience could’ve been a more stable and nurturing one. “There’s not enough funding to support the foster care system and create a healthy and safe environment for the youth,” Markley said. At the age of 15, he attended his first foster care education conference, and became aware of the issues that permeate the foster care system, not just in Oregon but nationally. Attending these conferences paved the way to his transition to foster care advocacy work a year later. Prior to getting involved in the advocacy world, Markley said, he didn’t want to be associated with foster care. “I really tried to be a quote-unquote ‘normal kid,’” he said. It wasn’t until he began meeting other foster kids like him that he changed his mind. To that end, Markley has been involved with several foster youth advocacy nonprofits, including OFYC, and in 2015 launched a blog called FosterFight.com to tell his personal story and share about the work he’s done in the foster care community. The goal of the blog, Markley said, is to inform people about the system and inspire current foster youth to make the most out of their experiences. Markley’s own experience in foster care ended on a happier note, relatively speaking. As Markley was approaching high school graduation, his younger brother was struggling in high school, and the foster family they were staying with told them they’d have to leave after Markley graduated. So, Markley had to make a decision: put college on hold to work and take care of his brother or find a new placement. Soon after, a friend texted him that her grandparents had recently become a certified foster home and were willing to consider taking Markley and his brother in. It was with that family, at the age of 18, that Markley found a home. “Until I was 18 years old, I didn’t feel 100 percent part of someone’s family,” he said. But these foster parents welcomed him into their home. While he aged out of foster care at 21 and lives on his own now, he still goes home for family dinners. Now, with a bachelor’s of science degree in psychology from University of Oregon, he’s heading to Lewis and Clark College to pursue a master’s degree in professional mental health counseling. Markley hopes to work in the mental health field, working with at-risk kids and foster youth.